You may notice that I actually did this ride on the 31st December 2015 (in preparation for New Year jolliness in the evening), but the Audax season is from 1st November. I was going to do a ride every month of the Audax season, but I can pretend it’s December – December. I decided to venture roads I haven’t travelled for some time and planned a route to the dark heart of Surrey: https://connect.garmin.com/activity/999764080. This took in the hardest hills I know and I thought my legs could do with the challenge. 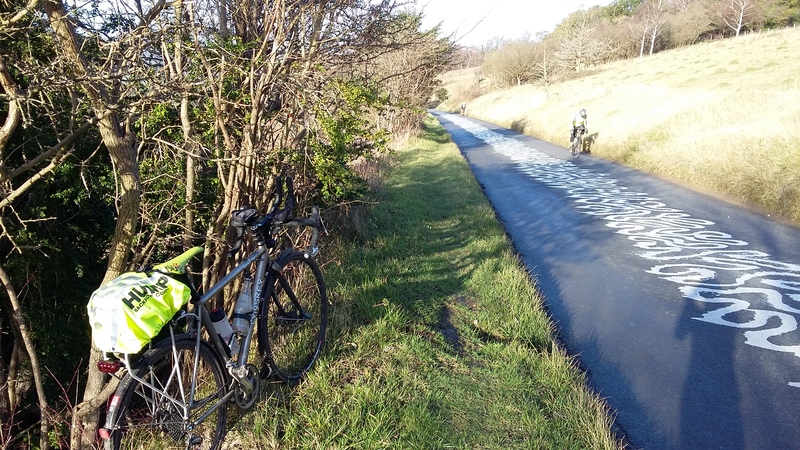 As I expected for Surrey, the roads were in terrible shape (apart from Box Hill and the descent from Leith Hill, which used to be a trench) and there were loads of people out. Fortunately, many of these people were road cyclists, so I got some competition. Turns out I was on the slow side for a MAMIL, but I held my end up reasonably well given the continuous nature of my ride. First a group of 3 roadies managed to chase me down slowly over about 5km of rolling country. Then, after Winterfold (Barhatch lane out of Cranleigh) I spotted another roadie up ahead. I slowly closed him down until I caught him on the White Down lane ascent. He then managed to break me on the 20% ramp towards the top (I think maybe I should have used a slightly higher gear and stood on the pedals), but stopped at the top, where I continued. Finally, on Box Hill, about 1/3rd of the way up, I spied a light behind. I managed to keep out of reach to the top, though I think they managed to close down 100m. 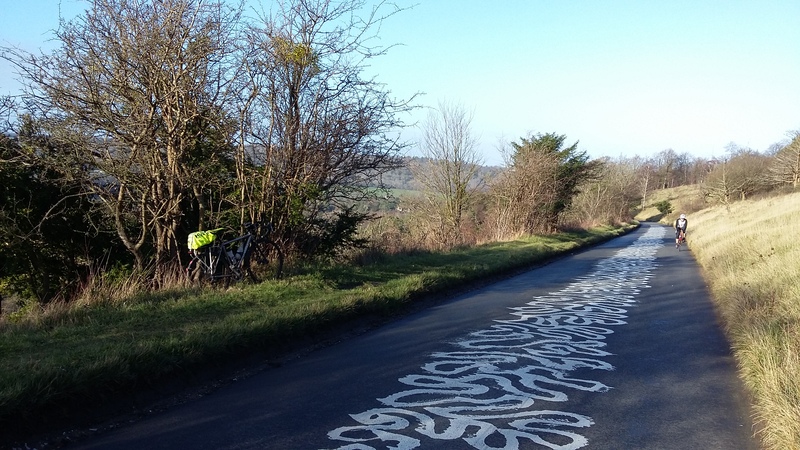 I have a feeling that the Box Hill pursuer was the same chap as I followed up White Down. Box Hill was in rather nice sunshine (prior to heavy rain showers on my way down Leith Hill) and has developed a nice lot of random road graffiti since I last saw it. So I stopped to take some pictures on the descent. Other random things that happened were the near squirrel suicide under my front wheel and being hit on the side of the helmet by something on the way out of Dorset. There was no one visible, but I may have spied the nets of a tennis court a way off the road, which was about the right weight. I’m not sure of my actual total time, but I think it was about 4hr 30, which is abit slow for a 100k. I put that mostly down to the wind and narrow wet descents that I took very carefully. I’ve also noticed that I tend to get hiccoughs after 100s. This is really annoying as I would fully expect exhaustion and sore legs (both of which I had) but not bloody hiccoughs.